Well, here we are again… I know. Why am I even surprised?! I should know better by now! The first Transformers, was a total fluke. The only hope at this point is a total reboot. Okay, I’m going to be upfront with you guys. This review might have a few spoilers, but not full-on spoilers. It’s just that some of the things I’m going to talk about in this review might inadvertently lead you to figuring out some of the movie’s plot points and twists, not that you wouldn’t have been able to do it on your own in the theatre. I’m not going to be saying them out right, but they will however be implied. So, if for some reason beyond me, you still want to waste your time seeing this movie, and have yet to do so, please feel free to stop reading this review and come back here after you’ve clearly wasted three hours of your life. We’ll be here for you, like a support group, but without the milk and cookies. In Transformers: Dark of the Moon, a movie so poorly written they can’t even get the subtitle right. I mean shouldn’t it be Dark Side of the Moon?! Ugh, whatever! 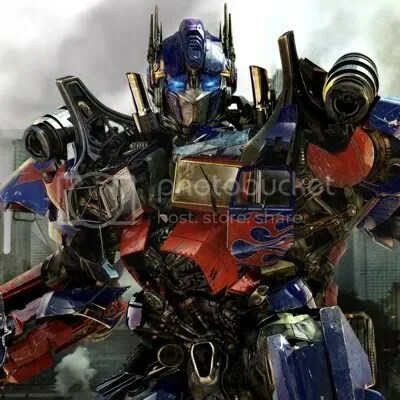 So the Transformers are still working with the U.S. Government, minus the racist gold tooth learning disabled bots, which are replaced with slightly less offensive racist stereotypes, and the I can’t tell one from the other Decepticons are still in hiding. Sam Witwicky (Shia LaBeouf) is fresh out of college and is having a really hard time finding a job that makes him feel important again in his post robotic war lifestyle. And I’m sorry, but why is John Malkovich in this movie?! His character seriously serves absolutely no purpose! 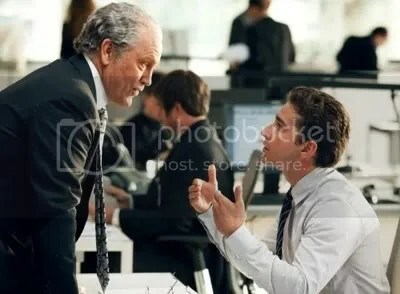 Remember when seeing John Malkovich in a movie meant it was going to be good?! Boy, are those days over! Let’s get back on track. Sam’s got a new girlfriend, Carly (Rosie Huntington-Whiteley), mostly because director Michael Bay fired Megan Fox for quitting after Transformers: Revenge of the Fallen. Yeah, doesn’t really make a whole lot of sense, but that’s okay because who cares, well not the screenwriter that’s for sure. Just like in Speed 2, the script for Transformers: Dark of the Moon is, I’m guessing, the exact same as it would have been if Megan Fox’s character Mikaela was still around. There are a few added lines to make Carly fit-in, but the role was clearly written for Mikaela. Case-in-point, Carly has supposedly never seen these alien robots before now, but yet she manages to have a heart to heart conversation with Megatron, when she’s never even met him before. I for one find that amazing, because even I can barely tell the Decepticons apart. That scene makes way more sense with Mikaela, but once again at this point who cares? And while we’re on the subject of writing, here’s a tip: maybe don’t give away a major plot twist in the first ten minutes of your film with the use of an old Star Trek clip. Once again, not that I didn’t see it coming without your help, but that’s beside the point. Oh, and when did Optimus Prime become a cold-blooded killer? Did I miss a meeting?! Way to completely miss the point of the “good guys” Bay! I don’t think I ever needed to her Optimus say, “You die now!” or see him shoot someone execution style in the back of the head. I’d also like to take a moment to talk about product placement, and the use of two Australian NASCAR bots. I would love to know how much Target had to dish-out for the coveted codpiece. What is it, with Michael Bay and balls? 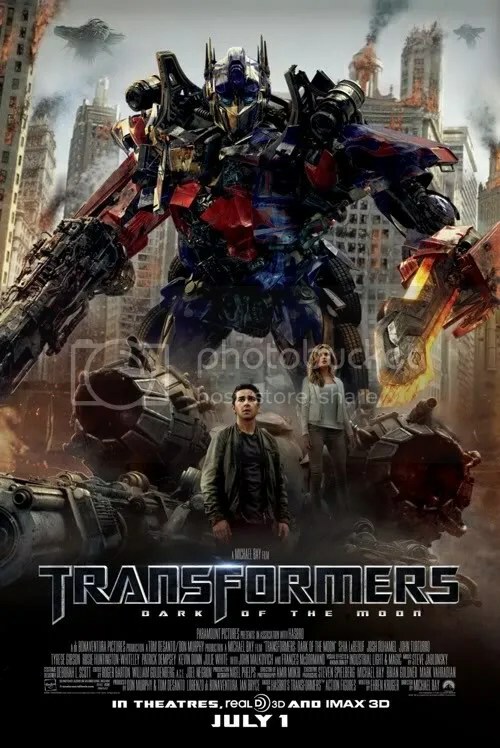 I’ve known for sometime now that Michael Bay is a total douchebag, but this film just confirms it. How you ask? 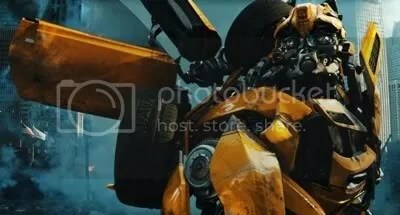 Well, even though Bay hasn’t officially announced that he won’t be making another Transformers movie, he did manage to kill-off almost the entire cast. Much like a 5 year old in a schoolyard sandbox that finds out it’s time to go, he chooses to break all his toys instead of letting other kids play with them when he’s gone. Douchebag. The only problem with that is this isn’t a sandbox, and luckily for us, Hasbro will most likely just reboot the entire series. Even if that’s not the case, I’m with Shia on this one. This will be my last Michael Bay Transformers movie!